Culms: Erect or ascending, sometimes bent and decumbent below, hollow, glabrous to short-pubescent, especially near nodes. Blades: Flat, folding lengthwise when drying, 1.6 to 8+ inches long, 1/8 to 1/3 inch wide, midrib not prominent, short-pubescent to glabrous. Sheaths: Shorter or longer than internodes, open, not keeled, glabrous to short-hairy. Ligules: Dense fringe of soft white hairs, less than 1/25 inch long. Inflorescences: Panicle, slender, contacted, cylindric, 2 to 6 inches long; composed of 8-22 spike-like, closely overlapping, 1-sided racemes mostly .4 to .8 inch long. Spikelets mostly occurring singly along 1 side of each branch; paired near base. Spikelets: Elliptic-lanceolate in outline, 1/8 to 1/5 inch long, 1-flowered, more or less soft-hairy; tip tapered to narrow point; short-stalked; cup-like collar just below base of spikelet; first glume much reduced; second glume 1/8 to 1/5 inch long, 5-nerved, pubescent, awned or tapering to sharp point; sterile lemma similar to second glume, elliptic-lanceolate, 1/10 to 1/6 inch long, 5-7-nerved, tapering to sharp point; fertile lemma elliptic, 1/10 to 1/8 inch long, finely wrinkled. Habitat: Open, disturbed areas, fallow fields, roadsides, ditches; moist ground. Comments: Forms bushy clumps. 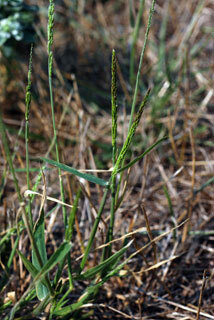 The spikelets appear to be set in a thickened, shallow cup at the top of the stalk. In fresh plants, this cup-like base is yellowish.